An evidence locker at the Vermont field office of the Bureau of Alcohol, Tobacco, Firearms and Explosives is filled with confiscated guns. Vermont's loose gun laws and a high demand for drugs make a lucrative market for drug dealers who accept guns in return for the drugs they sell. Because no law enforcement agency keeps track of guns specifically traded for drugs, no one knows exactly how many guns are involved in trades like this nationwide. But the Vermont field office of the Bureau of Alcohol, Tobacco, Firearms and Explosives (ATF), whose caseload mostly involves interstate or international gun trafficking, has seen it happen over and over. "It's not so much just firearms trafficking to make a profit [off the guns themselves]," says Jim Mostyn, resident agent in the Vermont ATF field office. 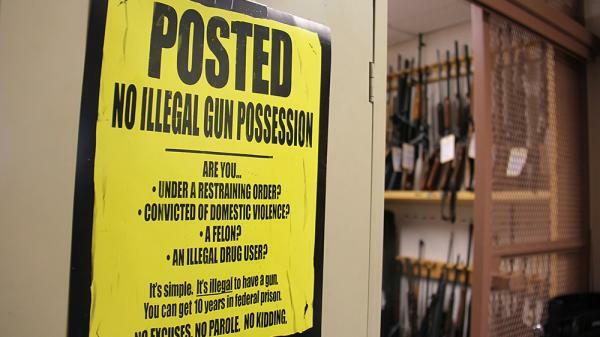 "What we're seeing is the narcotics for the guns." Tristram Coffin, the U.S. attorney for Vermont, also says his office often sees the direct exchange of guns for drugs. Part of the reason drug dealers accept guns as payment is because they know those guns can sell for a steep markup on the black market, says Mostyn. "It's a supply-and-demand scenario," he says. One woman illegally bought handguns in Vermont for about $400, then traded them to a drug dealer in Massachusetts in exchange for $500 to $700 of crack cocaine, he says. Bringing guns to surrounding states like Massachusetts, Connecticut and New York, and even Canada, can get dealers a big return. "These guns get a higher value in [surrounding] states because they're harder to come by," says Mostyn. U.S. Justice Department officials see similar cycles in other parts of the country. Law enforcement officials in Vermont agree that adding ATF agents and expanded resources could lead to more dealers getting caught — but increased funding doesn't come easy. The state is largely Democratic but has a strong tradition of shooting sports, so the politics of gun control are complicated. An assault weapons ban proposed after the Newtown killings, for example, was withdrawn after an outpouring of grass-roots and legislative opposition. That opposition came from people like Ed Cutler, president of Gun Owners of Vermont, a pro-gun advocacy group. At the Central Vermont Gun Show last weekend, he sat under a banner that read, "Dedicated to a no-compromise position on gun control." But Cutler agrees with a wide array of state officials on another issue: Rather than tightening up on gun sales in Vermont, they've rededicated their efforts to slowing the demand for drugs. "Locking up a user is not helping anything," says Cutler. "Lock up a drug dealer, help the user." Shumlin has announced $10 million in state funding for addiction treatment programs and a $10 million federal grant for prevention counseling. The new funding is aimed at keeping cash — and guns — out of drug dealers' hands. State officials in Vermont have been trying to crack down on a major drug problem. And to do it, they're mostly focusing on prevention and treatment. But the state's addiction problems have also fueled another kind of crime. Guns are relatively cheap and easy to get in Vermont, and they're being used as currency to buy heroin and other hard drugs. Here's Taylor Dobbs of Vermont Public Radio. TAYLOR DOBBS, BYLINE: Vermont has a long history of hunting and other shooting sports and one of the lowest rates of violent crime in the nation. And there are no state level restrictions on gun ownership. The easy availability of guns, paired with the demand-driven drug market, means out-of-state drug dealers are cashing in. JIM MOSTYN: It's a supply and demand scenario. DOBBS: That's Jim Mostyn. He's resident agent in charge of the Vermont field office of the Bureau of Alcohol, Tobacco and Firearms. He says most of his officers' caseload involves interstate or international gun trafficking. MOSTYN: It's not so much just firearms trafficking to make a profit, where we're seeing people buying loaded guns to take them to a state where there's tough gun laws and then selling them for cash. We're not really seeing that. What we're seeing is the narcotics for the guns. DOBBS: Because these trades are illegal and because no law enforcement agency keeps track of guns being specifically traded for drugs, no one knows exactly how many guns are involved in trades like this nationwide. The U.S. attorney for Vermont says his office sees the direct exchange of guns for drugs often. Mostyn says part of the reason drug dealers accept guns for drugs is because they know those guns can sell for a steep mark-up on the black market. He points to one case of a woman illegally buying handguns in Vermont for 350 or $400. He said she would then trade them to a Springfield, Massachusetts drug dealer for 500 to $700 of crack cocaine. MOSTYN: States that surround us like Massachusetts and Connecticut, New York, even Canada, where we have trafficking that goes into Canada for that same reason, is that these guns get a higher value in those states because they're harder to come by. DOBBS: U.S. Justice Department officials say they see similar cycles in other parts of the country. Law enforcement officials in Vermont agree that adding ATF agents and expanded resources could lead to more dealers getting caught. But they also recognize that increased funding doesn't come easy. Vermont's a blue state but it has a strong tradition of shooting sports, so the politics of gun control are complicated. An assault weapons ban proposed after the Newton killings was withdrawn after an outpouring of grassroots and legislative opposition. CUTLER: Here's a receipt for you. DOBBS: Ed Cutler is sitting behind a table at the Central Vermont Gun Show. He's president of Gun Owners of Vermont, a pro-gun advocacy group. A banner above him reads, dedicated to a no-compromise position on gun control. Rather than tightening up on gun sales in Vermont, state officials have rededicated their efforts to slowing the demand for drugs. That's a stance Cutler agrees with. CUTLER: Locking up a user is not helping anything. Lock up a drug dealer, help the user. There are lots of programs out there to do that. DOBBS: Governor Peter Shumlin has announced $10 million in new state funding for addiction treatment programs and a $10-million federal grant for prevention counseling. The new funding is aimed at keeping cash and guns out of drug dealers' hands. For NPR News, I'm Taylor Dobbs in Colchester, Vermont. Transcript provided by NPR, Copyright NPR.